The tow ring provided with the car is housed in the tool box under the boot mat. remove the plug (without turning it) making a movement perpendicular to the supporting surface (see figure). 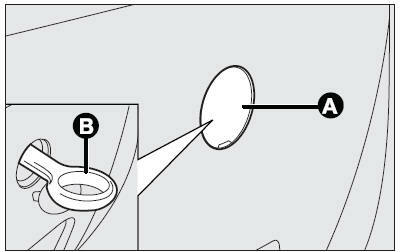 tighten the hitch (B) on the front or rear threaded pin. turn the ignition key to MAR and then to STOP. Do not remove the key. If the key is removed, the steering lock engages automatically resulting in the impossibility to steer the wheels. that without the help of the servobrake and power steering, a greater effort is required on the pedal and steering wheel. Do not use flexible cables for towing and avoid jerks. 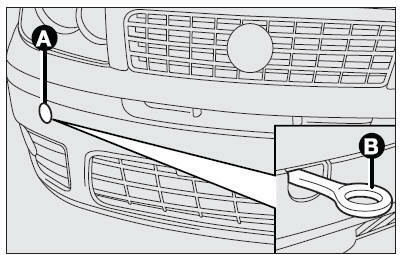 During towing operations make sure that fastening the joint to the car does not damage the components in contact with it. When towing the car, you must comply with the specific traffic regulations regarding the tow ring and how to tow on the road.